Little Dragon classes are exclusively for children ages 4 to 5. 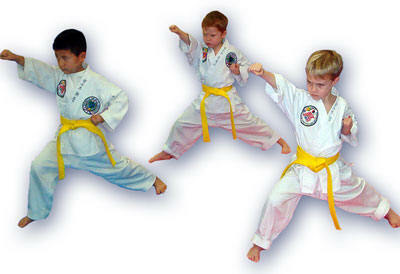 The classes are keyed to provide basic martial art instruction, physical fitness, social interaction and fun. A typical child's attention span at this age is relatively short, so we keep our Little Dragon classes under thirty minutes. In this time span, however, your child will receive a great workout, an introduction to the world of martial arts... and learn self-discipline and mutual respect. Unlike other sports, martial arts is lifestyle training focused on whole child development - mentally, physically, socially and emotionally. Although students can compete with their skills, it isn't recommended for this young age group yet as more focus is placed on doing their personal best and not on being "better" than others. US schools teach knowledge and social skills. While this knowledge and understanding is beneficial schools do not always help produce a well-rounded child. Through our instruction we help a child become a better person. We teach not just with words, but also by practicing physical skills. By including the physical skills in our instruction children get a chance to actually practice concepts like respect, good manners, focus and patience. As they get better at these skills they gain confidence. This confidence shows in all areas of their life, not just during class. A Korean Proverb tells us what is learned in the cradle is carried to the grave. Childhood is a very important time to instill good values. By starting with good habits now your child will find the good path. We have been instructing children since 1992. Many children have grown up to become well-rounded adults. 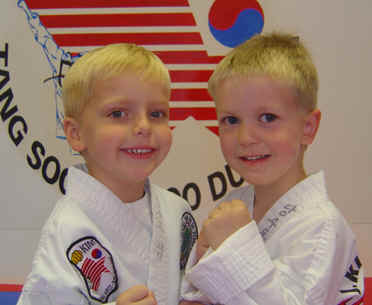 If your child trains with us, we can help your child. One of the greatest gifts that you can provide for your child is the opportunity to posses the powers to achieve a successful life. What are these powers? Patience, concentration, humility, discipline, self-control, confidence, and a strong, healthy body with good coordination. Our Tang Soo Do is unique in athletics. It is not just a form of self-defense. It is a total learning and self-improvement activity. 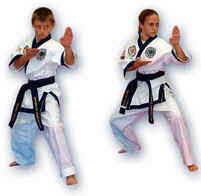 Children learning Tang Soo Do begin by practicing basic skills, which are the foundation of any sport. These skills improve and build coordination and balance. The children are always active in every class as they progress, instead of just warming the bench? Is your child picked on by others? If you have any of these problems with your child, now is the time to send him/her to one of our schools. No other institution can give your child a better program for personal development, growth, and achievement. We are experienced professionals in the field. After a few months of training each child will show dramatic changes such as a lower level of anxiety and an increased sense of responsibility, respect, and self-esteem. Most of all they will begin to show improvement in school. "As an exercise physiologists/biologist this is one of the most complete forms of exercise I have experienced. From 4 years of age through adult, this is complete fitness for the whole family. Tang Soo Do also teaches respect, discipline and true self-defense. My whole family has enjoyed this experience, and it has created a special bond between us."